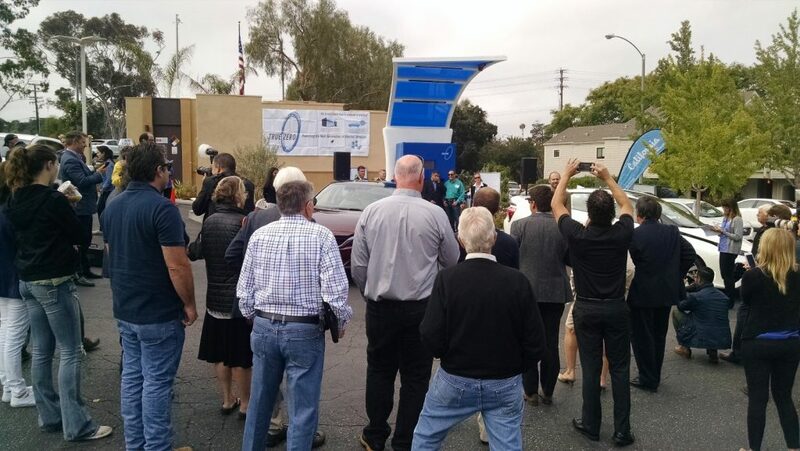 SANTA BARBARA, Calif., May 13, 2016 /PRNewswire/ — A major roadblock for widespread adoption of electric fuel-cell cars came crashing down today with the opening of the True Zero (www.truezero.com) station here, the latest addition to the world’s largest network of hydrogen-fuel stations being built in California by First Element Fuel, Inc. (www.firstelementfuel.com). Snipping the ribbon in front of the True Zero dispenser at Conserv Fuel, 150 S. LaCumbre Road, included: Aeron Arlin-Genet, District Director & Air Pollution Control Officer, Santa Barbara County Air Pollution Control District; Tyson Eckerle, Deputy Director of Zero Emission Vehicle Infrastructure, Governor’s Office of Business & Economic Development; Brad Cole, Hydrogen Unit, California Energy Commission; Chief Pat McElroy, Santa Barbara Fired Department; Peter Adams and Salud Carbajal, District Supervisors on the Santa Barbara County Board of Supervisors; Sigrid Wright, Executive Director and CEO, Community Environmental Council; Stephen Ellis, Manager of Fuel Cell Electric Vehicles Marketing, Honda USA, and Dr. Tim Brown, First Element Fuel Chief Operations Officer. Phase one of the True Zero Network (photos at www.truezero.com/images/), including the one here at Conserv Fuel, was brought online at an unprecedented speed and scale throughout the Silicon Valley, the greater Los Angeles area, the Lake Tahoe area and the San Joaquin Valley. The projects are funded in large part by grants from the California Energy Commission, South Coast AQMD and Bay Area AQMD, as well as partnerships with automotive firms Honda and Toyota who are first to market with fuel-cell electric vehicles. This generation of electric vehicles powered by fuel cells will be able to travel more than 300 miles on a single charge and a “fill up” of True Zero will take four minutes or less. “The Santa Barbara True Zero station serves not only the local market, but also as a destination and connector for fuel cell customers have access throughout California, through the Central Coast area and beyond, just like they drive a gasoline-fueled vehicle,” added Brown.